Manufacturers of opioids have witnessed tremendous growth in consumption in the last decade. This stupendous growth can be attributed to the absence of regulatory policies and lack of product knowledge among physicians. However, the scenario has changed and now, companies are facing challenges from reformed regulations. Hence, in order to sustain in such a regulatory environment, companies are now focusing on the development of more advanced forms of opioids that strictly adhere to the prescription and manufacturing regulations. In a new report on the North America synthetic opioids market titled “North America Synthetic Opioids Market: Global Industry Analysis and Forecast 2016-2024,” the analysts of Persistence Market Research have observed that pharmaceutical companies are highly focused on the development of tamper evident opioid drugs, owing to the high misuse of opioids. Companies are taking measures to develop non-abuse drug formulations to prohibit the misuse of opioids. For example, in July 2014, the U.S. Food and Drug Administration approved the newer form of OxyContin, a type of non-abuse opioid drug. The report further states that the U.S market holds the maximum share of opioid sales. After phenomenal growth in opioid sales, the market has become stagnant over the past few years, due to several regulations and restrictions on prescription drugs. The analysts have segmented the North America synthetic opioids market into four categories namely by country, by product type, by application and by distribution channel. The report begins with the executive summery and extensively covers the market overview, overall market approach, target geographies and differentiating strategies of key players in the North America synthetic opioids market. The executive summery is followed by the market introduction and consists of the definition of various types of products in the North America synthetic opioids market. The analysts have covered detailed analysis of the North America synthetic opioids market scenario. This analysis includes Y-o-Y growth and absolute $ opportunity for the forecast period. Various market dynamics that comprise drivers, restraints, opportunities and trends are covered in the report. The analysts have made sure to cover each and every segment in detail along with highlighting the market share analysis, BPS analysis and the Y-o-Y growth rate of the North America synthetic opioids market. The report concludes with key player profiles accompanied by key developments, business strategy overview and SWOT analysis. 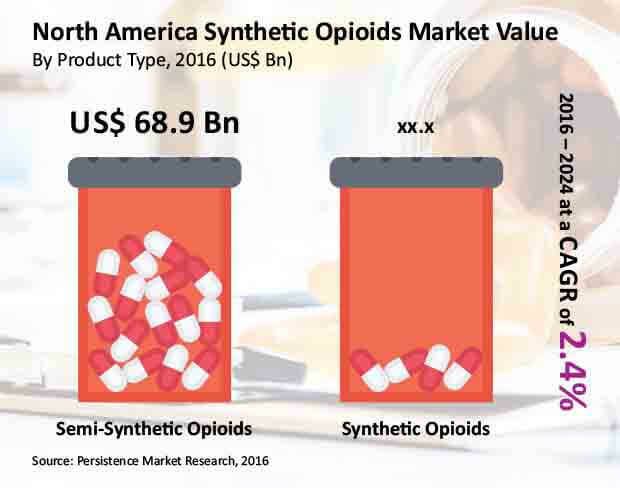 The semi-synthetic opioids segment accounted for more than 90% revenue share of the North America synthetic opioids market in 2016 and is expected to gain more than 10 BPS in its market share by 2024. The semi-synthetic opioids segment is expected to reach a market valuation of more than US$ 80 Bn by 2024, expanding at a CAGR of 2.5% over the forecast period. The segment’s revenue in the North America synthetic opioids market is expected to grow 1.25X by 2024 end as compared to that in 2015. The semi-synthetic opioids segment dominated the North America synthetic opioids market in terms of revenue in 2016 and is projected to continue to do so throughout the forecast period. The semi-synthetic product type segment is likely to remain an attractive segment, recording an attractiveness index of 1.8 over the forecast period. Rise in the number of patients suffering from terminal illnesses such as a severe cough resulting from lung infection, cancer, HIV, along with a high surge in the prescription for post-operative pain medication are factors expected to boost the consumption of semi-synthetic opioids as pain medication. Furthermore, rising awareness about palliative care in terminal disease conditions is boosting the adoption of opioid drugs globally. Favored reimbursement policies and rising awareness about palliative care services in the North America region are factors driving the consumption of semi-synthetic opioid drugs. In the U.S, palliative care services are delivered in accordance with government and commercial reimbursement policies. Hospital palliative care programs in the U.S include palliative care consultation teams and dedicated in-patient palliative care units. Non-hospital palliative care programs include ambulatories and office and home-based palliative care programs. Increasing prescriptions of semi-synthetic opioids for de-addiction programs is also likely to create a positive impact on the semi-synthetic opioids segment. Methadone and Buprenorphine are widely prescribed drugs in opioid de-addiction programs. Due to the over prescription and abuse of opioid drugs these days, the demand for de-addiction opiates has increased. In 2015, more than 20 million Americans suffered from substance use disorder, which included 2 million people suffering from the abuse of Suboxone, one of the blockbuster drugs containing buprenorphine. The introduction of novel opioids, especially in Abuse Deterrent Formulation would enhance the growth of the North America synthetic opioids market. New products with innovative formulations and drug designs such as abuse-deterrent formulations in Oxycontin and Opana are likely to fuel the branded opiates market. Moreover, the U.S. Food and Drug Administration is encouraging drug makers to come up with new generation drugs that make them less attractive to addicts. Increase in new drug applications by pharmaceutical companies and the number of products in their pipeline is a key growth driver for the semi-synthetic opioids segment of the North America synthetic opioids market. The semi-synthetic opioids segment accounted for more than 90% revenue share of the U.S synthetic opioids market in 2016, and it is expected to gain 10 BPS in its market share by 2024. The semi-synthetic opioids segment in the U.S synthetic opioids market is estimated to reach a market valuation of a little more than US$ 75 Bn by 2024. Semi-synthetic opioids generate huge revenue, attributed to their comparatively high prescriptions and increasing pain management demand in the U.S. The Canada semi-synthetic opioids market accounted for close to US$ 7 Bn of the total market revenue in 2016, and it is expected to gain more than 60 BPS in its market share by 2024.